The soft and padded Plush Pad has proved to be very popular with people looking for a versatile Earthing/Grounding indoor product. 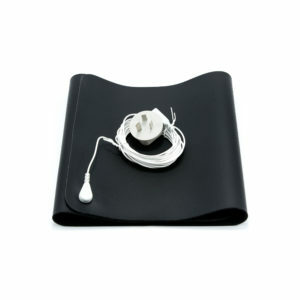 The conductive pad can be used to sleep on, relax on as well as wrap around areas of the body. It can be rolled and folded without damage. Small and compact to take when travelling for those that want to retain the health benefits of Earthing/Grounding the body. 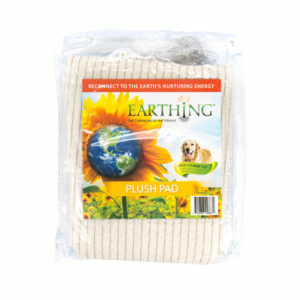 The Earthing Plush Pad is an organic cotton conductive pad and is like a mini version of the Throw/Blanket. One side is conductive and the other is not. This versatile small soft pad can be used for lots of Earthing applications such as on a chair to sit or lay on, behind your back, draped over your lap or to lay on in bed. The Plush Pad can also double as a pet pad as well! You can place directly on the floor or on top of the pets existing bedding – as long as they make direct contact with the mat. Please be aware that sharp objects like watches and rings make catch the soft thread of this fabric. Sleeping on a conductive sheet has proven to be highly popular and an effective way of grounding/earthing the human body. Sleep is the time when the body rests and recovers from the stresses of daily activities. If we do not sleep well, the recovery process works inadequately, making us susceptible to stress-related problems, illnesses and immune disorders. Sleeping grounded is the best way to reap the benefits of connecting with the Earth. 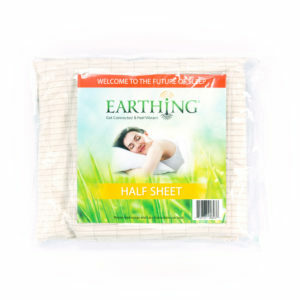 The Earthing™ half sheet is a universal half-sheet that is placed over your fitted base sheet. It is most commonly used at the foot end of the bed which conveniently grounds your body during sleep, however, you can place anywhere on the bed that is comfortable to you as long as you have bare skin touching it. Alternatively you can place the sheet lengthways so one person can sleep fully on the sheet. Sheet coverage is 3 x 0.9 metres, excludes tuck in areas and will fit all beds up to a King size. 100% cotton sheet with a woven network of soft, conductive silver fibres in a grid like pattern. Great for travelling. Written by Clint Ober, Stephen T. Sinatra, M.D. 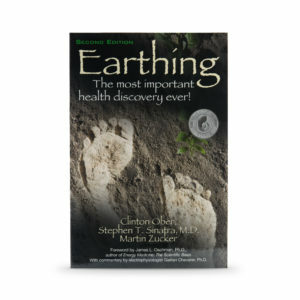 and Martin Zucker New 2nd Edition Earthing, the book, unfolds an amazing story of discovery and will change how you view the ground you walk on everyday forever. The book tells the amazing story of how Clint Ober, a retired cable TV Executive, stumbled across the benefits of Earthing or Grounding yourself with bare feet to the earth. Clint started his journey in the late 1990’s and for the past 10 years has been involved in researching and documenting the evidence. 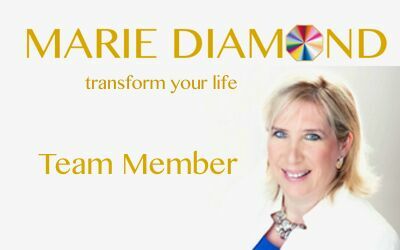 This book is backed up with scientific evidence, documentation and personal healing stories. Excerpt from new book: From David Richards, M.B.B.S., an integrative family physician in Iluka, New South Wales, “In my more than thirty years as a general practitioner,I’ve never had anything to offer patients for diabetic neuropathy. No doctor really has anything. All we can do is try to optimise blood sugar and control it. But that doesn’t fix the problem of numb feet. Earthing has changed this dilemma altogether..." "Chronic inflammation is regarded as the root cause of most modern day diseases and the solution could be right under our feet." The Universal Mat has proved to be very popular with people using computers and electronics as it greatly reduces electrical charges being absorbed by the body. Reducing electrical charge build up may result in less back, shoulder and neck pain, keep you more alert and reduce eye strain, while working at a computer. The mats are also popular for always having you own "patch of Earth" right indoors, so that you can Earth/Ground the body when it suits you and no matter what the weather is doing outside. The Earthing™ Universal Mat can be used on top of a desk under your keyboard and mouse, or under your desk with bare feet contact as well as on a chair or couch. When working in an office environment we are often surrounded by very high electrical fields, which some people are sensitive to and they can become tired, experience sore eyes and lose focus. By working "grounded" you will greatly reduce the the electrical voltage you are being exposed to, keeping the body balanced, and greatly reducing or eliminating electrical stress on the body. An absolute must for anyone working at a computer station or surrounded by electronic equipment. Excellent for targeting pain in a particular area – brings earthing directly to the spot of inflammation. The bands contain conductive silver fibres on the inside that ground the body when connected to a grounding system. The patches are similar to the ECG/EKG electrode patches commonly used by doctors for testing purposes. 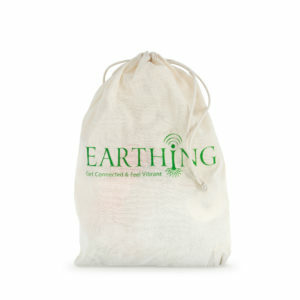 When used for earthing, you simply apply them to the skin on some part of the body, such as a site of tenderness or pain. The patches are disposable and will last for 2-3 uses. 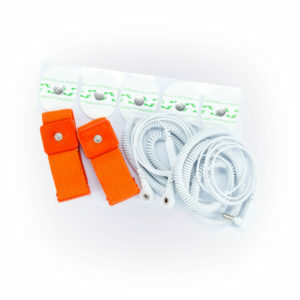 These bands and patches are connected to the Earth, either through your electrical outlets or by using a ground rod. ©2019 Spectrum Dowsing & Feng Shui. Website by Taran Dunn Design.